Adding details like ruffles to your sewing project can make it just a little extra special. 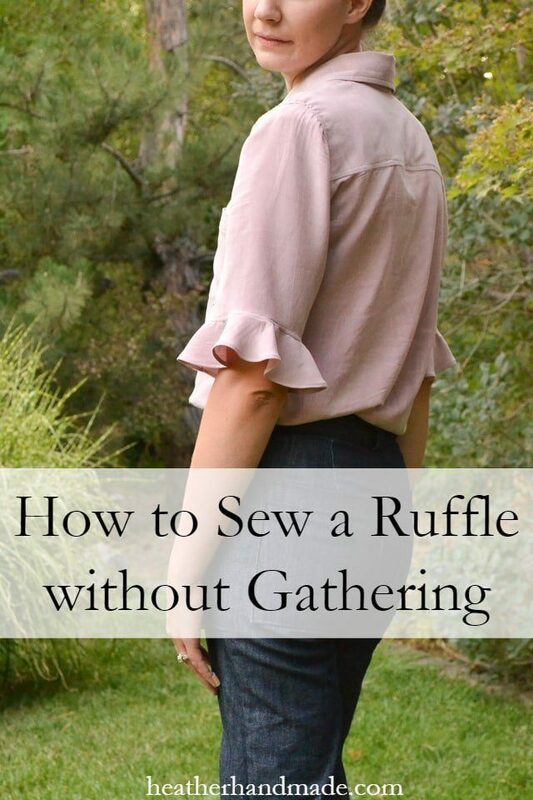 Do you know how to sew ruffles without gathering? 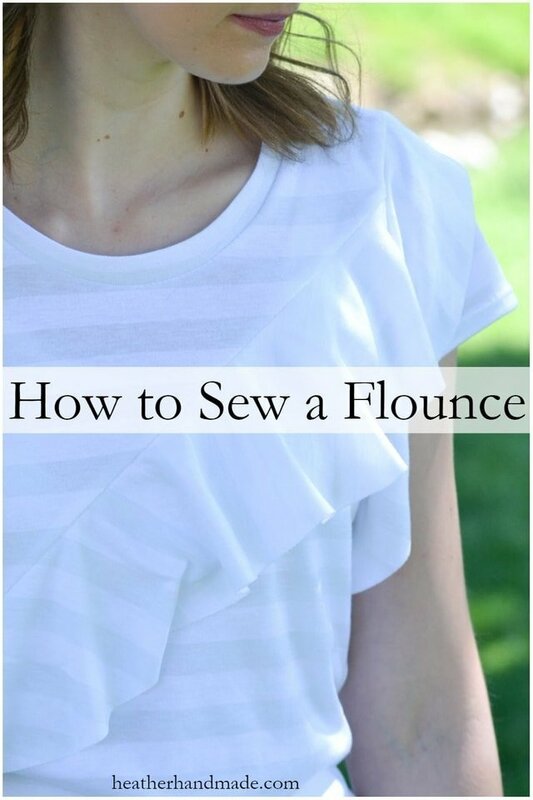 It’s called a flounce, and it’s so easy to sew! A flounce is a ruffle with little to no bulk. There is no pleating and no gathering. It’s cutting a curved piece of fabric and sewing the inner circle to a seam. This straightens it and creates a wavy ruffle. When the circle is pulled out straight the edge flares out. The size of the curve and the depth of the ruffle creates more of a wave. *Important to remember*: The small the inner circle, the more flared the ruffle. The larger the inner circle, the less flared the ruffle. You can also sew multiple flounces together for longer seams. 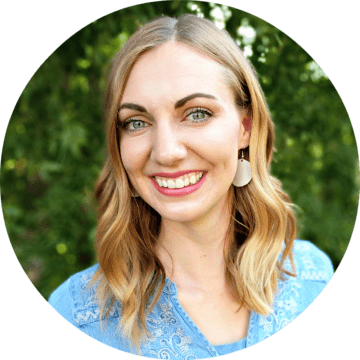 I’ve sewn a button up shirt with sleeve ruffles (pink shirt), a tee shirt with a diagonal ruffle (white tee), and my sister sewed a swimsuit with ruffles. Measure the length of where you want to add the ruffle. For example measure the hem of the sleeve, measure the diagonal seam, or measure the neckline, etc. Find a circular object like a plates, a lid, a bowl, etc. 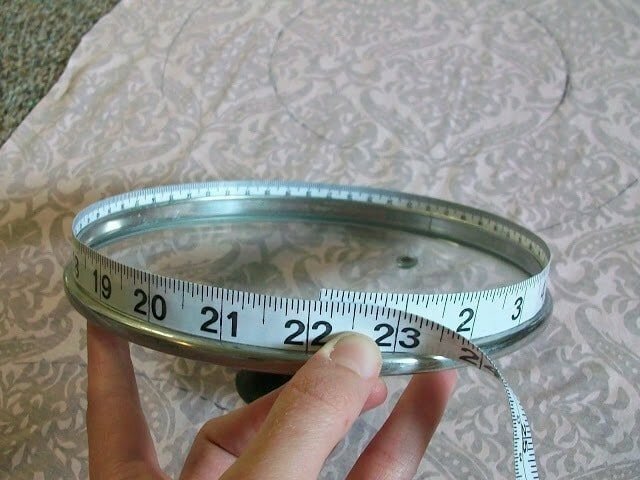 with a circumference that’s the same length or longer than the measurement of the seam. Draw that circle onto your fabric. Using a larger circular object to draw a bigger circle around the smaller circle. The distance between the smaller circle and the larger circle will be the height of the ruffle. 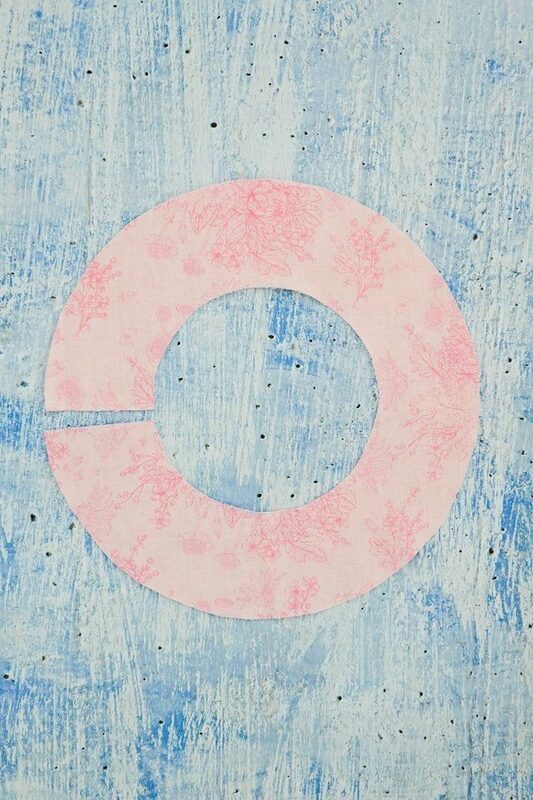 Cut out both circles. Cut through the ruffle to create one long line. 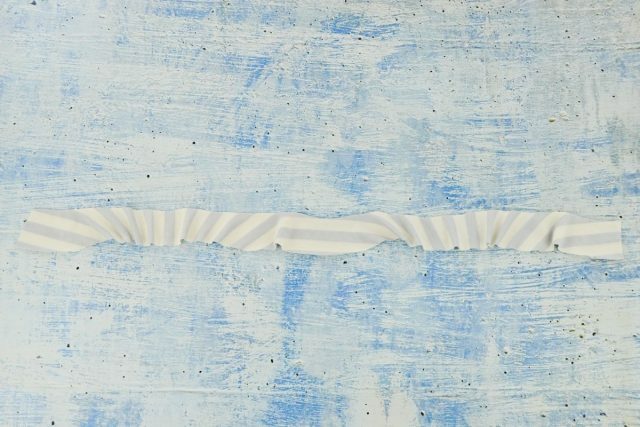 When you use striped fabric to make a ruffle without gathering the stripes will change direction all along the ruffle. I cut out two ruffles of the exact same size out of different fabric to compare the look. The pink fabric is basic quilting cotton. It is stiffer and has a lot of wavy flounce to it. The striped fabric is cotton spandex jersey. It is lighter weight and it was less wavy flounce. You can create soft ruffles without gathering using lightweight fabrics, and you can create stunning large ruffles using medium to heavy weight fabric. Thank you Heather. 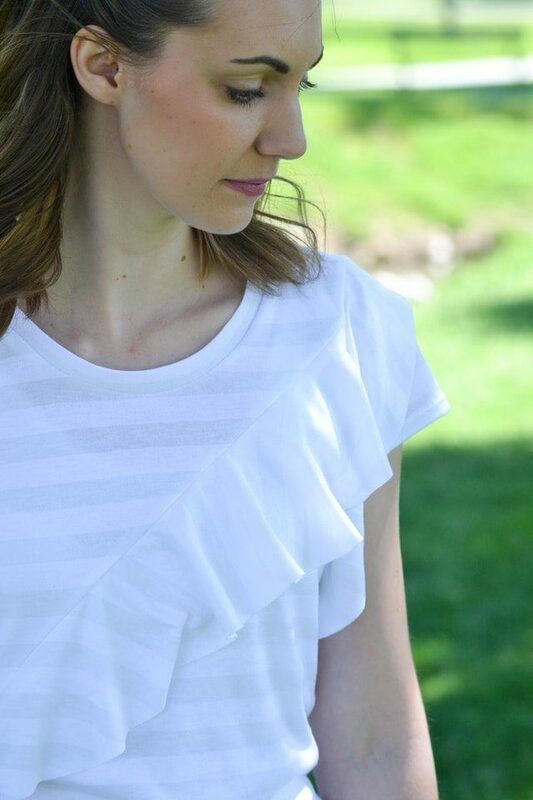 I love the look of flounced sleeves and will add a ruffle to my next make. Such a clear tutorial! 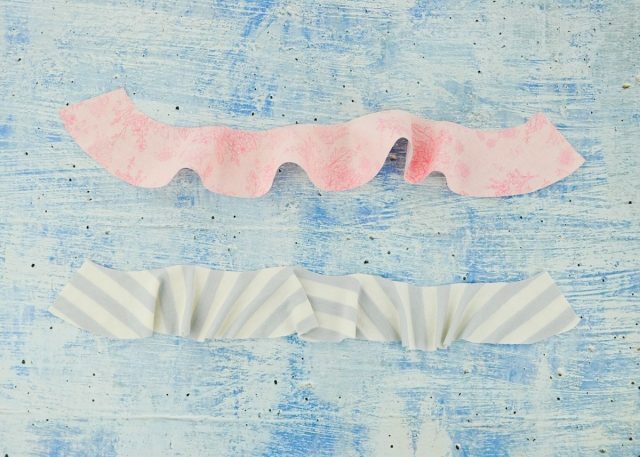 how did you make the ruffle go down the front? There's a center front seam on the shirt. I sewed the ruffle into the front seam. Awesome instructions! I don't know how you figure these things out, you're a genius!! When I'm hitting the Pinterest button, it's not transferring the picture. Then I get an error message??? Pinterest recently changed their "pin it" button, you have to re-download it. This happened to me too! Woow! I luv ruffles but I always wondered how to sew them and this looks like the easiest way! Thank u, Thank u …. Hey, thank you for this tutorial. I love ruffles, I am going to try this soon! And I am definitely following your blog!